[MEDIA] - "BLADE RUNNER 2049" New poster ! "BLADE RUNNER 2049" New poster ! Warner Bros. Pictures has released a new poster for "BLADE RUNNER 2049", coming to theaters on October 6, 2017. Thirty years after the events of the first film, a new blade runner, LAPD Officer K (Ryan Gosling), unearths a long-buried secret that has the potential to plunge what's left of society into chaos. 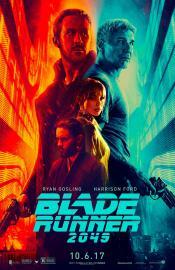 K's discovery leads him on a quest to find Rick Deckard (Harrison Ford), a former blade runner who has been missing for 30 years. The film also stars Ana de Armas, Sylvia Hoeks, Robin Wright, Mackenzie Davis, Carla Juri, Lennie James, with Dave Bautista, Edward James Olmos and Jared Leto. Synopsis : Thirty years after the events of the first film, a new blade runner, LAPD Officer K (Ryan Gosling), unearths a long-buried secret that has the potential to plunge what's left of society into chaos. K's discovery leads him on a quest to find Rick Deckard (Harrison Ford), a former LAPD blade runner who has been missing for 30 years.